Every country has their own local cuisine to brag about. 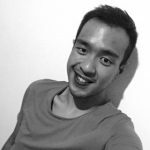 In Vietnam, these are the top local foods that I tried and would like to recommend to everyone. 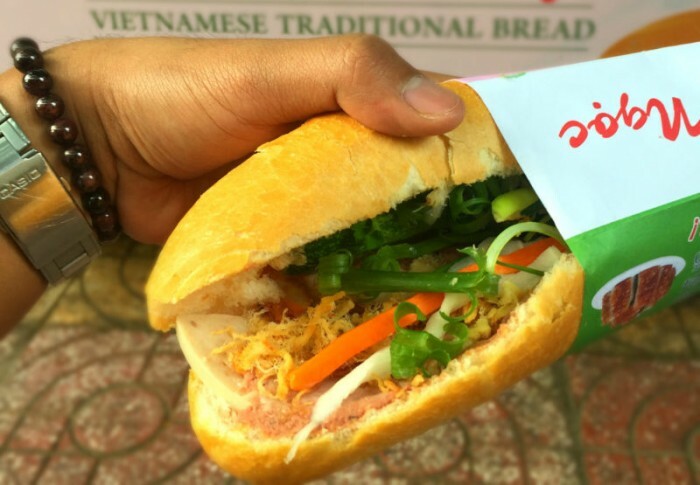 Along with pho, the most exported Vietnamese speciality is banh mi. Walking around Saigon, you’ll see dozens of carts with signs selling banh mi – it’s actually hard to go more than a block without seeing one – so it’s never hard to find. The basic sandwich starts with a crusty baguette that’s sliced in half (sometimes using scissors) and stuffed with layers of pork, luncheon meats, shredded cured pork skin, pâté and mayonnaise. Vietnamese radish and carrot pickles, a handful of sliced cucumbers, sprigs of coriander (cilantro), and last but not least, an optional, a slice of habanero chilli. I am not a fan of chillies so I just omit them. I tried it in Bánh Mì Hồng Ngoc, this is located just across the street from our hotel. 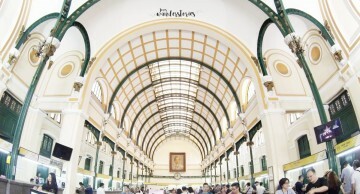 Another dish on this list is not from Saigon, but from Hanoi. 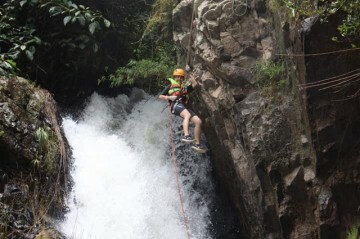 However, I was able to try this when I was in Ho Chi Minh City. 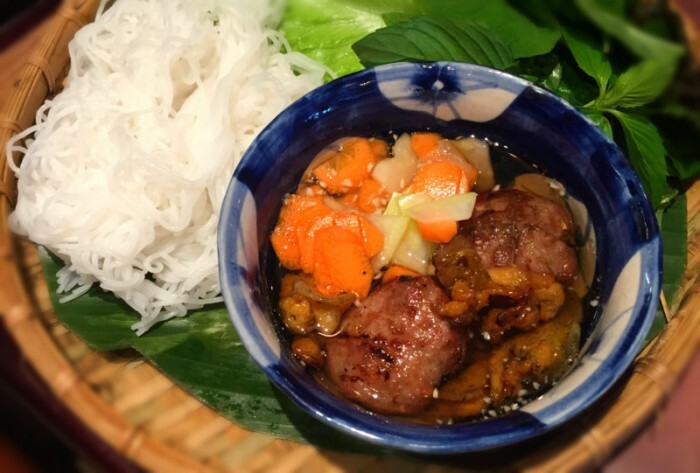 Bun cha is a dish that uses baguette, fresh rice vermicelli noodles, the same noodles used in bun thit nuong, which are soft and easy to chew. The next component of bun cha, are little seasoned pork patties (like pork sliders), that are grilled over charcoal. A plate of baguette is served alongside a bowl of grilled pork patties, which after being grilled, are served in a smokey sweet and sour dip, and finally, a plate of herbs and green vegetables are served to accompany everything. 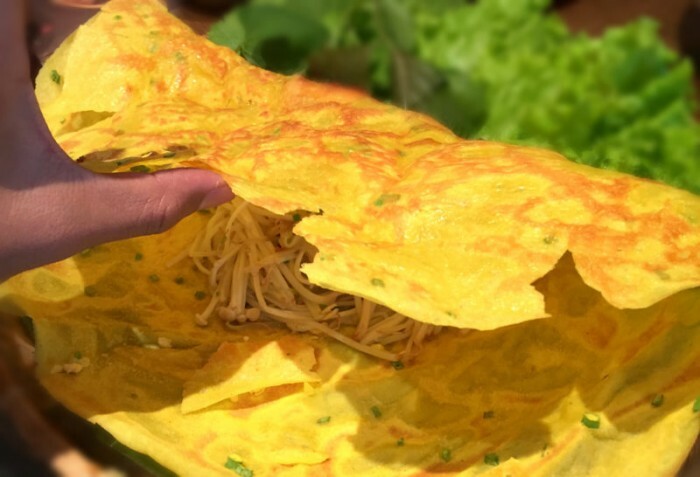 Sort of like a crepe than an omelette, a Vietnamese banh xeo is a crispy savoury snack that’s a favourite for many. A thin layer of batter is fried in a lot of oil, then combined with your choice of ingredients, often including slices of pork, shrimp, and onions then folded over with a handful of lightly cooked bean sprouts in the middle. The best part of eating banh xeo is getting to dress and garnish each bite with a bounty of herbs and toppings. You can eat banh xeo however you want actually, but the common method is to take a few lettuce leaves or mustard leaves, load in a piece of the golden crispy crepe, top it with some more herbs like sweet basil and perilla leaves, add some chili (or not), roll it up like a green spring roll, and then dip the entire treat into the sweet Vietnamese fish sauce dressing. 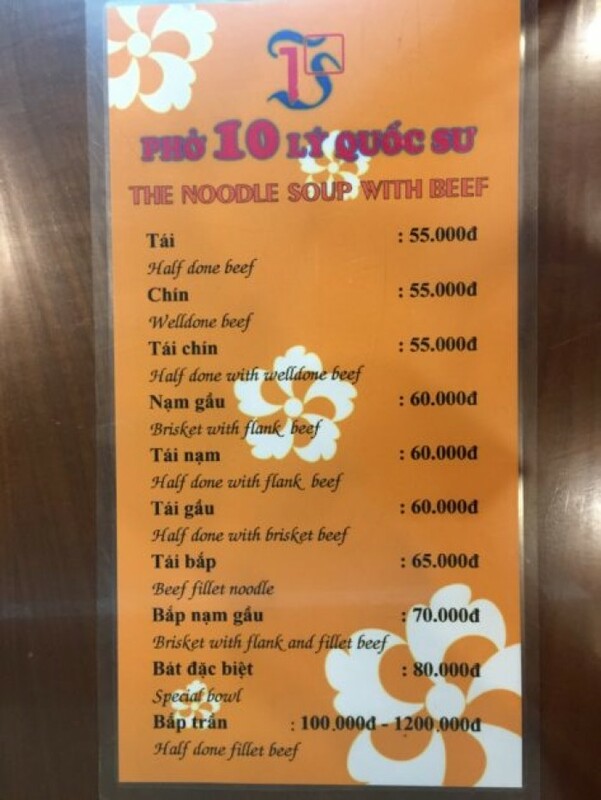 Vietnam truly is the home of noodle soup. Aside from the famous Pho, this one is one of my favourites as well. The broth is made from a crab base stock, and another key ingredient are tomatoes, which create a broth that’s slightly seafood tasting, yet has a beautiful natural sweet and tartness from the tomatoes. I think there’s also often some rice vinegar included in the recipe to give it a lovely sour and well-rounded flavour. 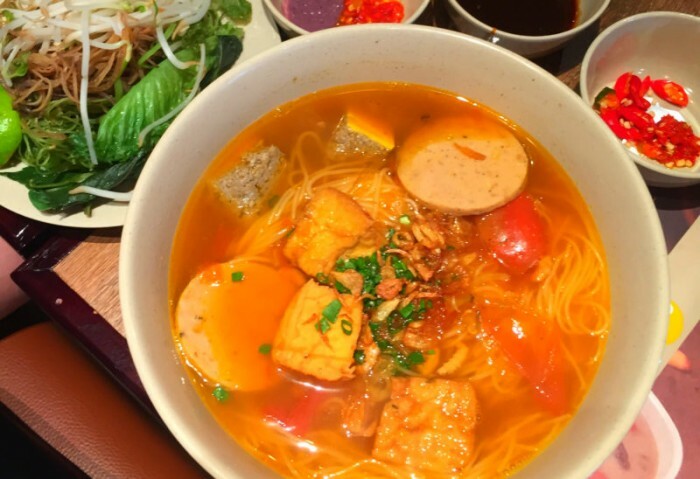 Along with the wonderfully flavourful broth in a bowl of bun rieu, the noodles are often similar in shape and size to spaghetti noodles, except soft rice noodles. Topping the noodles are pieces of golden fried tofu, sometimes meatballs, hearty chunks of pork, squares of congealed pig’s blood, and finally a slab of rich crab paste. 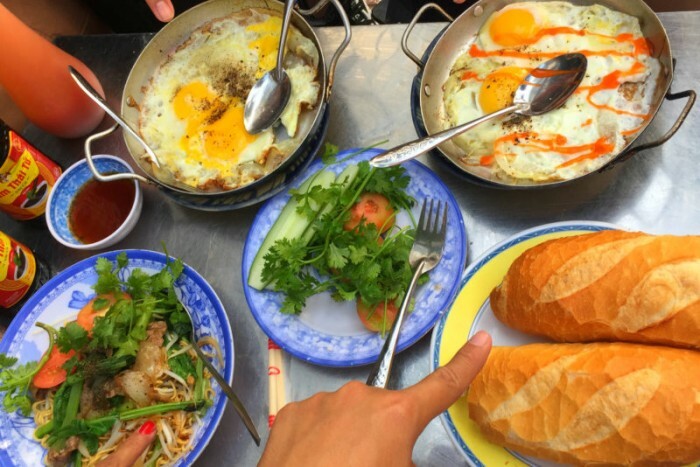 Ốp la (op la) is a traditional breakfast dish of freshly toasted baguettes with eggs fried in a personal pan served in mostly every street corners of Vietnam. I ordered two runny eggs, which were topped with a stir-fried beef, and a handful of caramelised onions and green peppers. This dish is a good one to start your day. 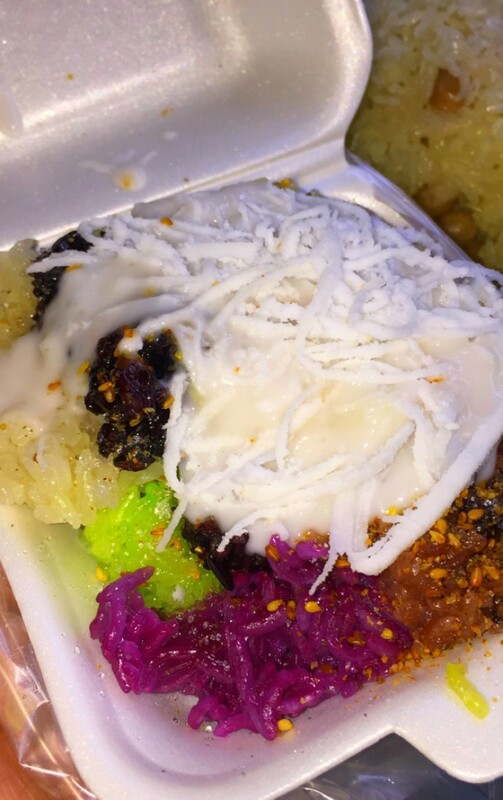 Sticky rice in coconut is a staple street food in Vietnam. You can find it in every night market there is. 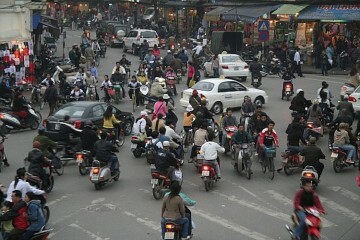 I tried one in Ho Chi Minh City during the night just across Ben Thanh Market. The sticky rice itself was nothing compared to the sticky rice I had here in the Philippines. It was well-cooked, and with a hint of thick coconut cream and a dash of coconut shaving, everything became instantly perfect! 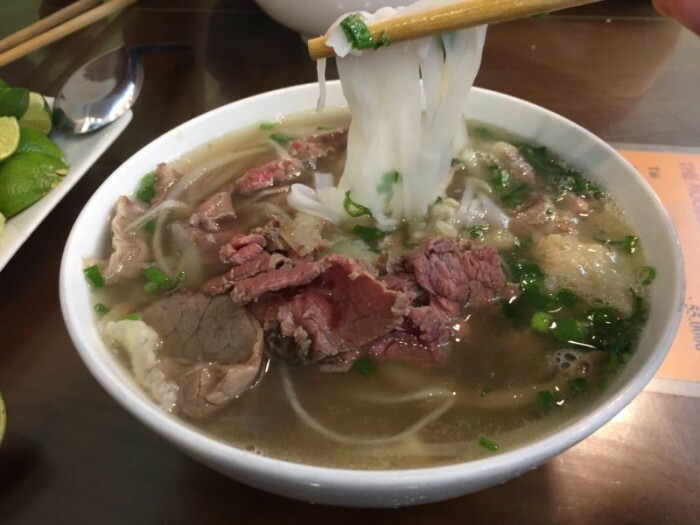 While Pho is fairly well-known throughout Vietnam, I was able to taste this when I was in Hanoi. 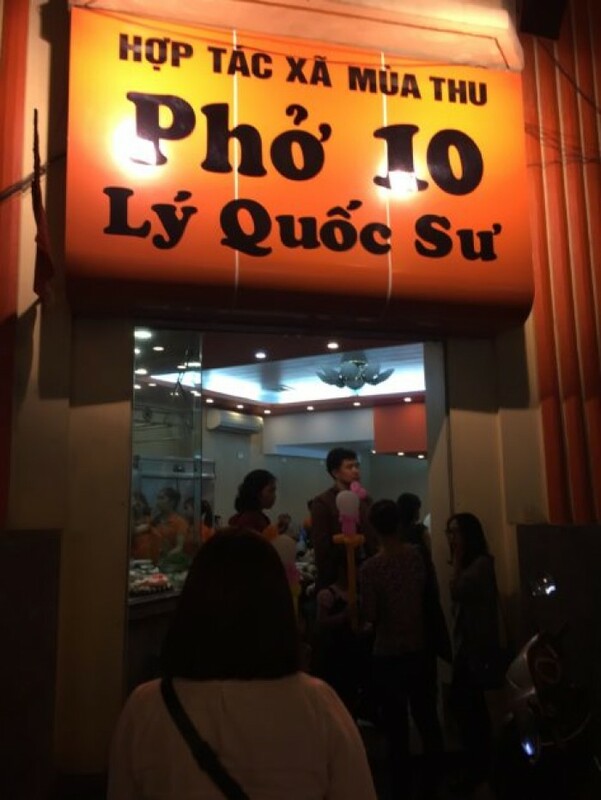 It was on our last night in Hanoi and I wanted to try Pho before we depart, so our tour guide suggested a place that is quite well-known in Hanoi for its Pho. 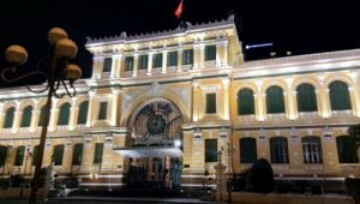 Cha Ca Thang Long (14 Cha Ca Str.) is where I tried this dish. 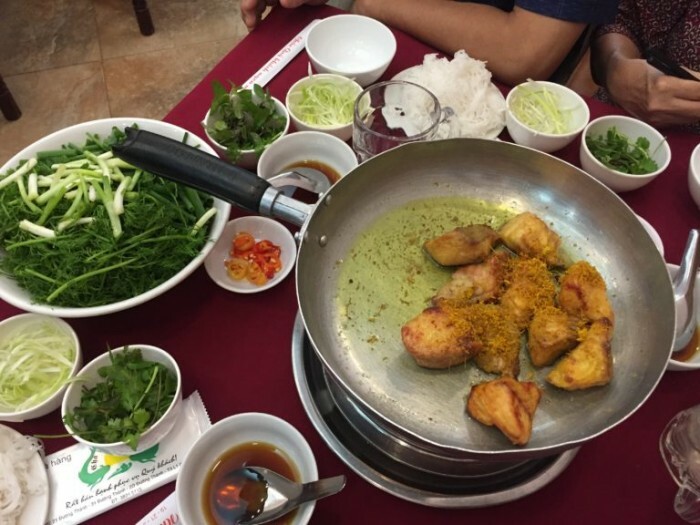 Châ Cá (also known as Châ Cá Lã Vong) is an infamous Hanoi traditional dish. 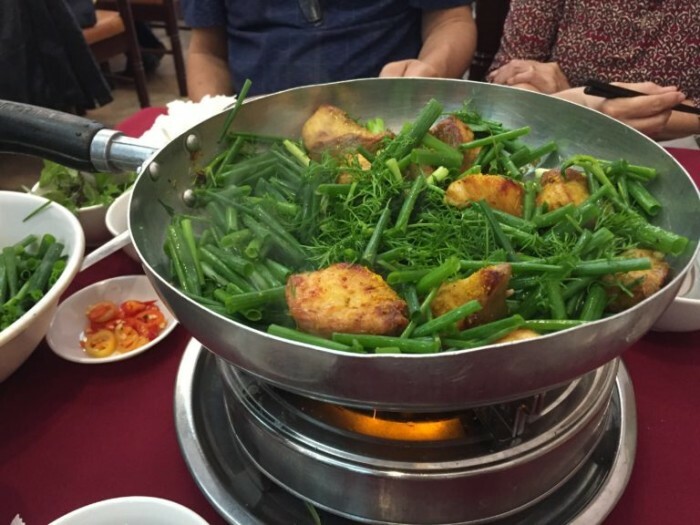 It is a tumeric marinated fish that is first grilled and then fried table-side. 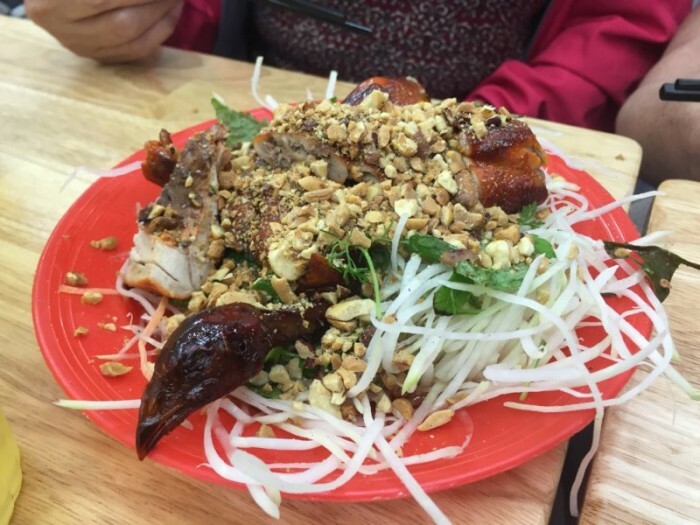 It is served with tons of fresh dill, scallions, herbs, crushed peanuts and rice noodles. 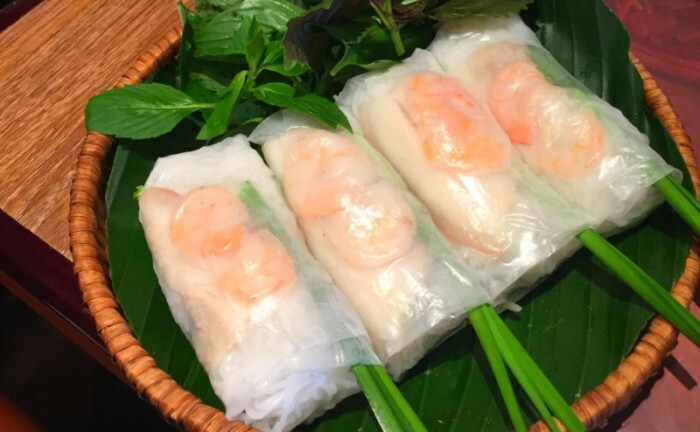 Gỏi cuốn is known as fresh Vietnamese spring roll while chả giò is the fried version. 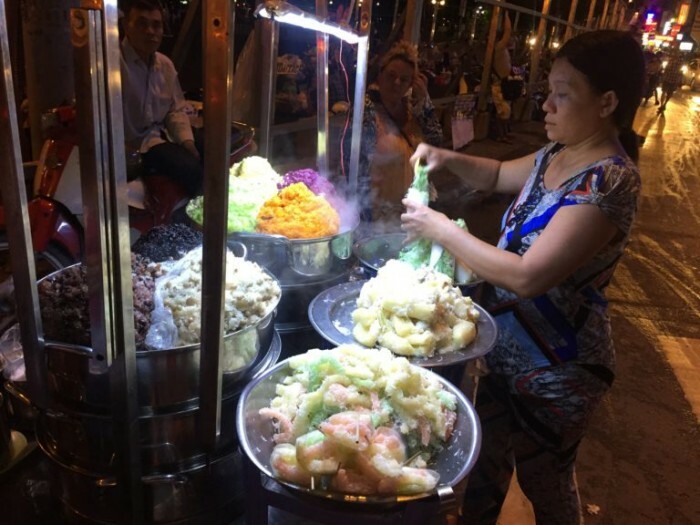 I was able to try this both in Ho Chi Minh City and in Hanoi. You can pretty much eat this everywhere in Vietnam. 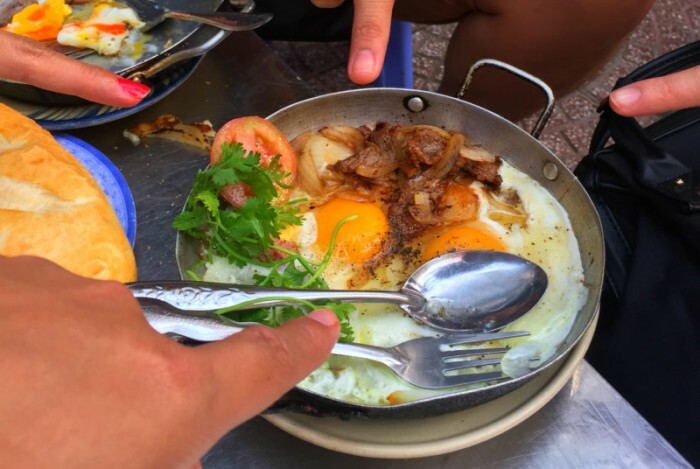 While researching and reading blogs for my Northern Vietnam itinerary, I came across reading a few blogs about this– egg coffee. It seems it is a must-try for a foodie like me. 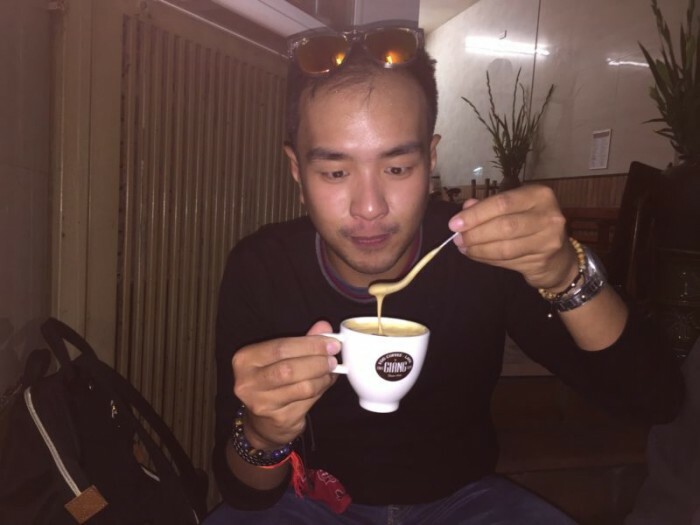 The drink is served in cafes throughout Hanoi, and has been a staple since the 1950s, with one barista describing it as appearing on “every cafe menu”. As a coffee lover, I did not make any second thoughts to include this in my Foodie list. There are numerous cafe’s in Hanoi already that serve egg coffee, but there’s this one hole in the wall that really stands out! 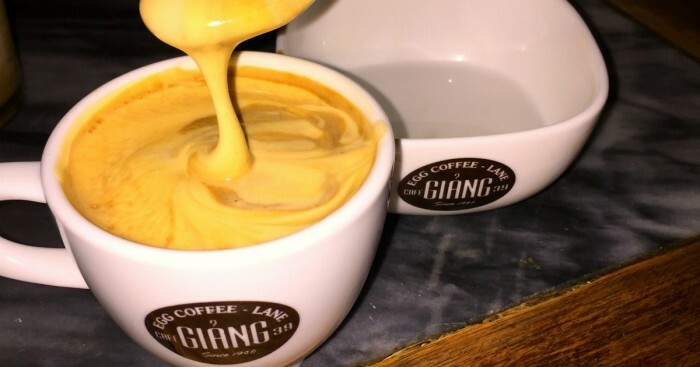 Cafe Giang. I came across this kind of sweets while strolling along Hoan Kiem Lake during the night. Vendors are often seen at the sidewalk stretching. Curious, I ask what it was and saw that children often buy it so I bought one for myself. The way this candy stretches really amazes me. The taste resembles like that of a nougat but stretchy. My curiosity brought me to try this. We were on our way to the Water Puppet Theatre when I saw this quaint place with locals and tourist alike swarming in there foot stool chairs eating as what I initially thought as chicken. Immediately, I read there menu and it states that what the customers were eating is actually another kind of bird. The place serves Fried Bird! Yep, bird! I don’t know what type of bird they are using as the owner cannot speak well in English. But I think they are using either a pigeon, a quail or a few-week-old chick. 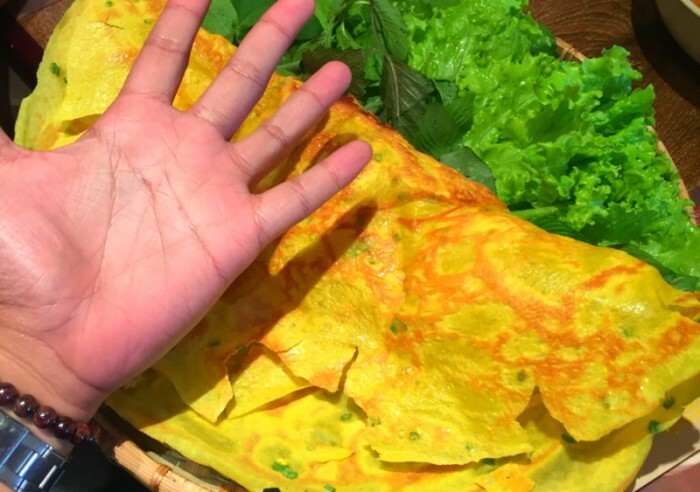 Okay, that’s it for the 12 dishes I think that are worth trying, but by all means, there are many other Vietnamese foods that you can devour when you’re travelling (or living) in Vietnam. Vietnam is among the greatest food destinations in the world, a country that I believe is worth visiting with the intention of just eating. I ate as much as I could, took photos and videos, and after eating a few meals, I downsized the list to 12 dishes, and this is the summary. 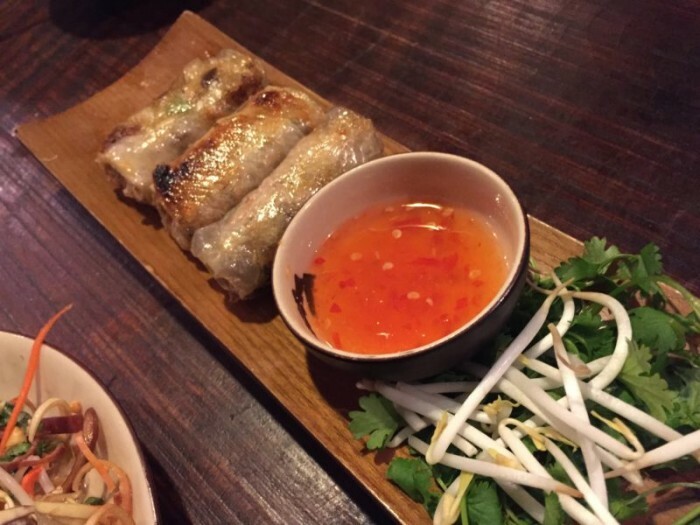 If you’ve made it to the bottom of this post, that means you’re serious about eating some authentic Vietnamese food.— (I hope you’re hungry by now, too)!